The sign language alphabet is a set of manual alphabetical letters that correspond to the written alphabet. It is often used for finger-spelling a person’s name, or perhaps for identifying the title of a brand or book. It is also used for terms that have no accepted sign equivalent. But if possible, signs are preferred over fingerspelling. And if you do not know the sign, consider describing the subject. In all letters aside from G and H, your palm faces the person to whom you are communicating. For G and H, you’ll keep your palm turned to your own body. Furthermore, only the letters J and Z involve motion. Try to keep your signing hand in one place at shoulder height, and pause between individual letters. There is one exception to this rule, though: In the word “Whoops,” and whenever there are double letters, the double O can be shown by moving the hand shape slightly to the side (or by slightly bouncing it). Use whichever hand is the most comfortable for you. There is no difference, but try to be consistent. Start by spelling your own name and your family members’ names. Download or pin the sign language alphabet poster and watch the sign language alphabet video below. 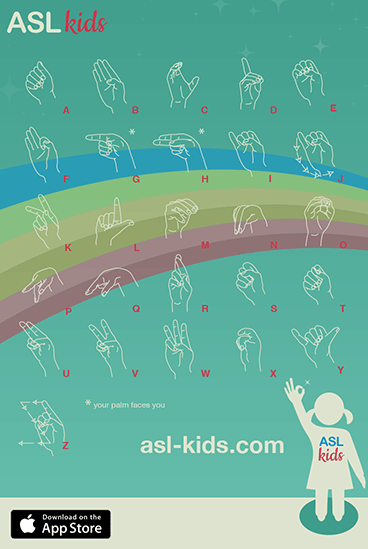 Although it is helpful to have an ASL alphabet cheat sheet hanging on the wall or sitting on your phone, it’s even better to see it in action. Especially when you are completely new to it. In the video below, you can see how the hand shape is changing from a natural position to the letter hand shape. Practice ASL while eating lunch? Check out this fun, easy to clean, and durable placemet for a great price. Okay, so now you know the sign language alphabet. Great! Now it’s time to learn some animal words. An even more fun way of learning ASL is by playing around with the iOS or Android app.